RK M-Sport World Rally Team’s Robert Kubica will be the star of the show as the FIA World Rally Championship (WRC) returns to his native Poland next week. As one of the country’s most respected and admired sportsmen, the Formula One race winner will be in high demand as he powers his Ford Fiesta RS WRC through the gravel tracks of the Polish Lake District. The Polish fixture last formed a part of the WRC in 2009 when Robert’s fellow M-Sport driver, Mikko Hirvonen, claimed the sought-after victory. Established in 1921, the rally is one of the oldest in the world and never fails to deliver an exciting and adrenaline-fuelled event. Similar to the iconic stages of Rally Finland, Poland’s fast gravel roads see the rally cars reach maximum speed as they fly through the region’s breath-taking landscape. But the picturesque setting hides a daunting task. Unexpected obstacles linger on the inside line, ready to catch out the unfortunate. Crews will need to have their wits about them as they navigate the tricky speed tests and a good recce is perhaps more vital than anywhere else on the calendar. Robert and his fellow countryman and co-driver Maciek Szczepaniak go into their home event with their confidence high. Following a solid finish in Argentina, the Poles went on to up their pace in Sardinia. Commenting on how much he had enjoyed the loose-surface challenge of the Italian stages, Kubica will be looking for a similar, incident-free event in Poland and – with the Polish fans behind him – the Lotos, Grupa Azoty and Michelin supported driver will have all the tools he needs to deliver another progressive performance in front of the home crowd. In appreciation of the huge support he receives in his native Poland, the 29-year-old will also be sporting a special livery for his national event. 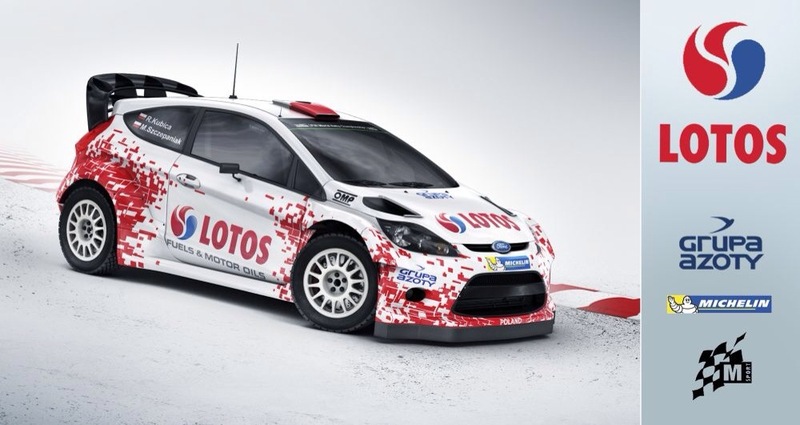 Embracing all things Polish, Kubica’s Fiesta RS WRC will be adorned with an eye-catching red and white design. “Competing in my homeland will be something very special, but on the other hand – strange as it sounds – it will be a completely new rally for me. I contested Rally Poland last year, but in this year’s edition not even 100 metres will be same and my approach will be the same as it was for the other new events. “I’m really looking forward to seeing all the Polish fans. This will be one of the country’s sporting highlights and I think there are many rally fans in Poland so it is nice that we have this opportunity – with the Polish Federation – to do this event. “I’m sure there will be a lot of support for the Polish drivers, but I just want to do a good rally and finish well without making any mistakes. I know that if I get to the finish and am happy with my driving then it will be a good rally. This is the most important thing for me and this is what I am looking for. “Talking about the results, I won’t be paying too much attention to that. The most important thing is to learn and enjoy. If I finish the last stage and I am happy with what I did behind the wheel, it will be the best result for me and bring a lot of satisfaction.